If you love pho and you're short on time, Star Anise Foods has the perfect solution with their Pho Noodle Soup Bowls, made with non-GMO ingredients and ready in just 3 minutes! Made with healty, clean ingredients, each bowl is packed with good-for-you brown rice noodles and authentic Vietnamese spices to give you flavors from halfway around the globe without leaving your kitchen. 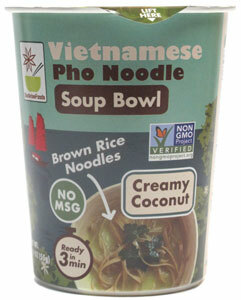 Just empty the contents of the enclosed packet onto the noodles, add hot water to the fill line, and you'll have a piping hot bowl of honest-to-goodness authentic vegan pho in a flash! You'll enjoy rich, savory broth with flavors of shallot, garlic, ginger, turmeric, and more, giving you a delicious vegan way to noursh yourself from the inside out!